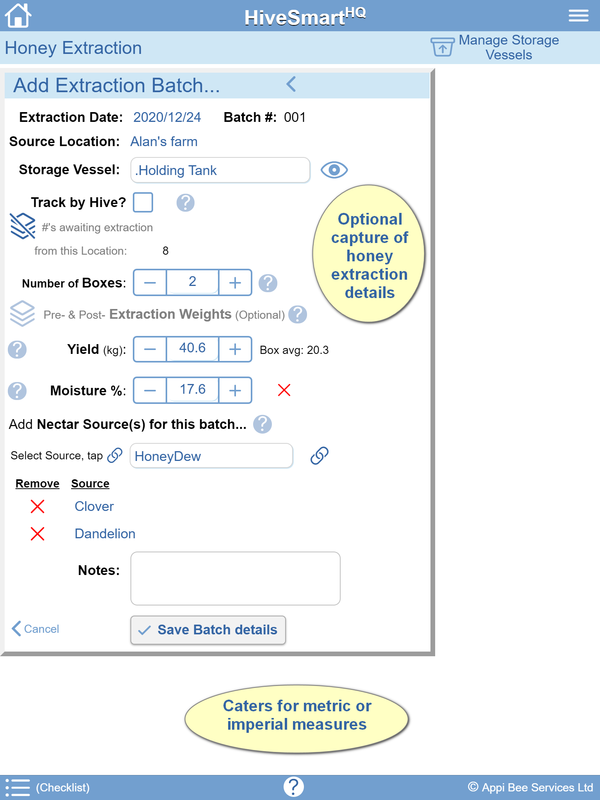 Includes far more than just Hive inspections, with bio-security tracking & record-keeping for industry compliance. Supports boxed hive types (e.g. Langstroth, Warré) as well as Top Bar Hives. Covers beekeeping activities right through to sales of Honey, Hives & related items. HiveSmartHQ is easily tailored to suit your region and needs - including metric or imperial measures and currency indicator options. 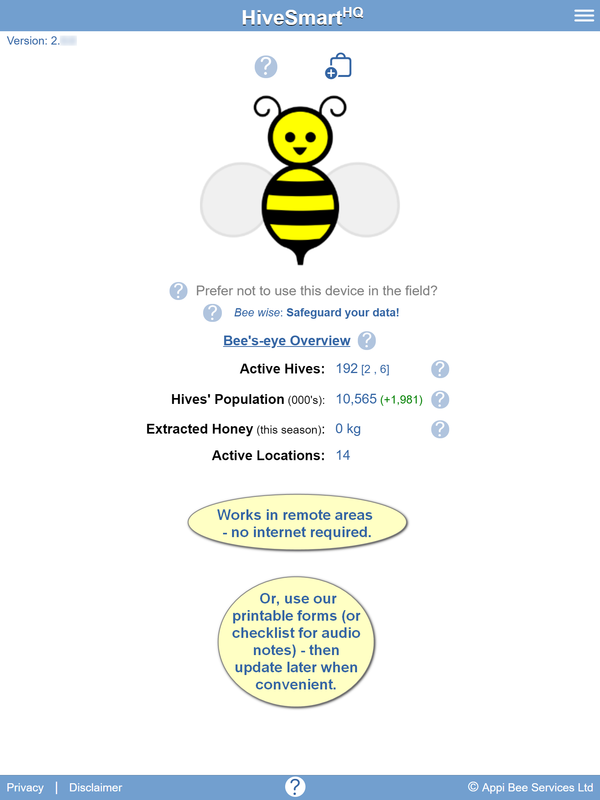 "It really helps in managing my hives and frequently saves me from doing extra trips to site." Latest version: 1.5.2 (January 2019). Tap the relevant store image below for the HiveSmartHQ listing. See the FAQ on how to run HiveSmartHQ on Windows 10. No login required. Subscription-free. Obligation-free. No Advertising. It's ideal for solo beekeepers running several hundred hives or hobbyists with just a handful. It can also support larger commercial operations (see FAQ below). We appreciate that folks keep bees for different reasons and there's a variety of different philosophies and approaches. HiveSmartHQ leans towards those who look after bees to make a living (or supplement their income) from the surplus honey that healthy bees produce or by developing hives for sale, so it supports the end-to-end business processes from maintaining hives through to the sale of honey and/or hives. 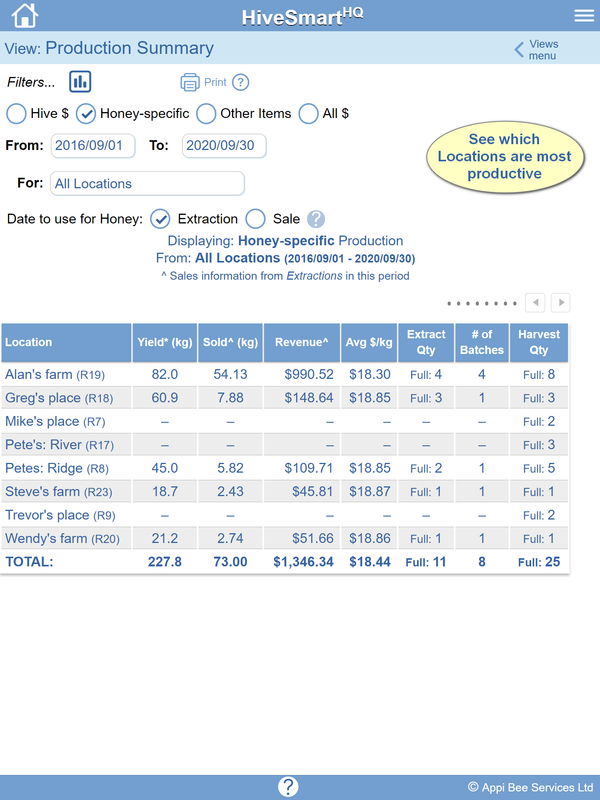 Using this tool gives you the information needed to save time and improve the productivity of your hives. In business-speak, it helps beekeepers improve their day-to-day efficiency and record-keeping, while providing the information needed for effective operational decision-making. Yep, we know: like all sound business practices it seems kinda boring - yet increasingly essential and extremely useful the more hives that you care for. Will HiveSmartHQ run on my mobile device? * For devices with ARM processors only. If the app does not operate on your Android device please let us know. NOTE: Older or low-end devices usually have lower performance and are less responsive to touch. Can I use HiveSmartHQ on a Windows 10 computer? 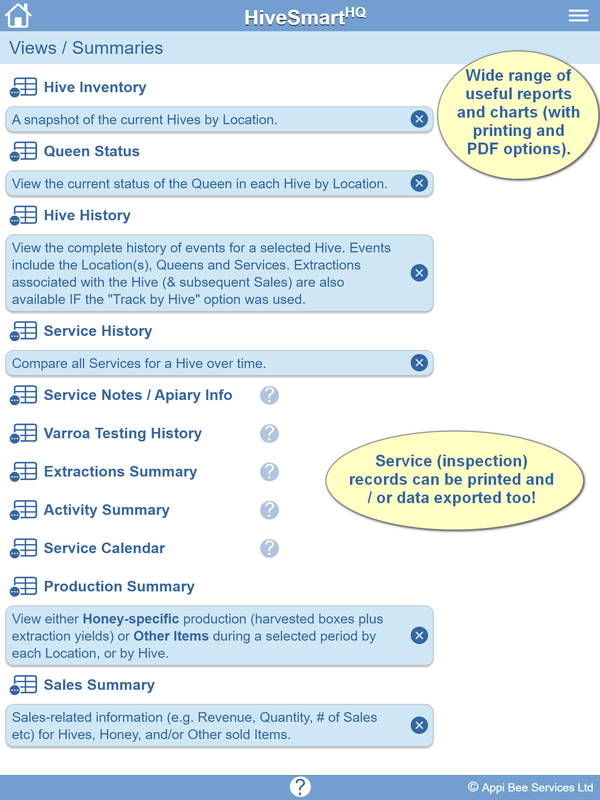 If you're only using HiveSmartHQ on a computer*, you may find our Forms useful when out in the field - Service, Collections and Extraction Forms are available on our Tips page for printing. 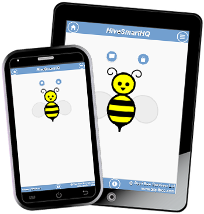 If you have HiveSmartHQ on a mobile device too, you can transfer the data between the device and the computer. Use Transfer Data (via App Options and Settings) to Upload from one and then Download on the other. The default mode for Nox is landscape orientation but this can be easily switched to portrait which matches the principal design for HiveSmartHQ. BlueStacks normally runs apps in landscape mode and for HiveSmartHQ we'd recommend changing the default BlueStacks display resolution to at least 1920x1080 (from 1280x720). 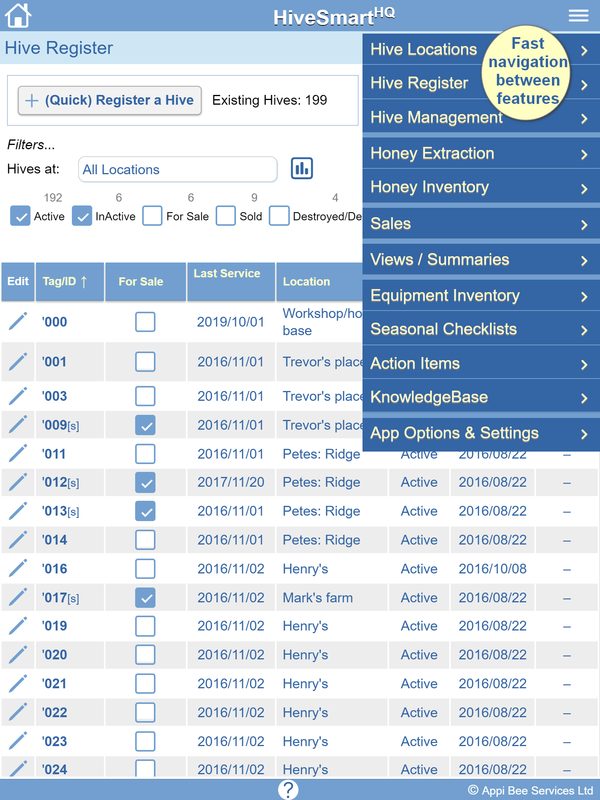 The option to include Seasonal Checklist items and Action Items from HiveSmartHQ in the device Calendar. Printing to a printer and/or accessing saved PDF versions of "printed" reports. 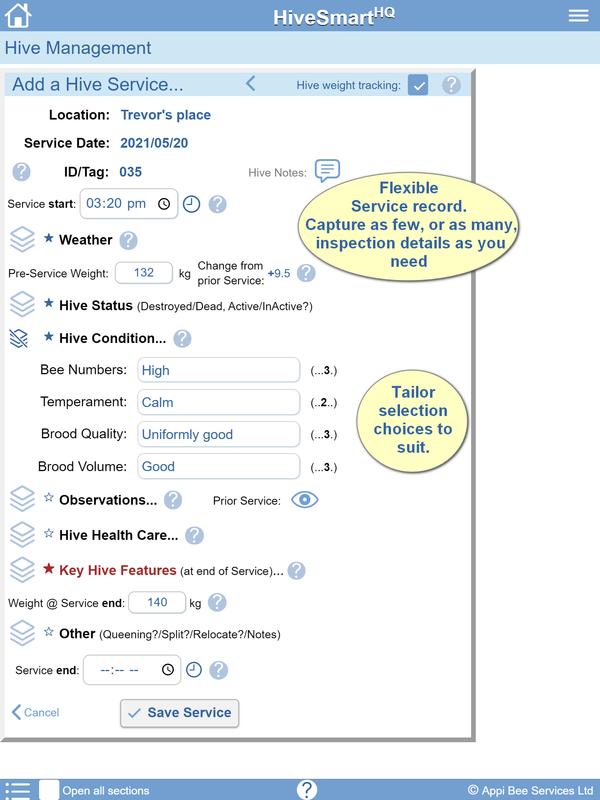 Exporting Service data in the multi-Tool via Hive Management. The option to map a new location may not work as expected in Hive Locations. Declaration: We have no connection with either Nox or BlueStacks or the parties behind these products. The use of an emulator is only mentioned as an option for our Customers to consider. Various Android emulator options can be found via an online search. Why does HiveSmartHQ request permission to access certain device features? Location access iOS + Android Hive Locations: Used when mapping a Hive Location (Optional). Storage access Android App Install: Provides the option on some devices to install the app on an (external) SD card (instead of the internal storage). Accounts access iOS + Android News Registration (via App Options & Settings) and Export data (via Hive Management/multi-Tool): Used when creating a draft ready-to-send email (to advise us about registration of an email address to receive HiveSmartHQ News, or an email to yourself containing the Service data respectively). Both features are optional use. Network access iOS + Android Various (Hive Locations, Transfer Data, Top-up Service Credits, links to our secure website): Used to determine current status of internet availability. All instances are optional use. Billing Service iOS + Android Top-up Service Credits: Used for secure purchasing of Service Credit bundles. Where can HiveSmartHQ be used? However, we also know some folk prefer not to actively use their device in the field so we've got that covered too - use our forms while in the field and update your device later. Service and Extraction Forms are available on our Tips page. Note: A couple of features do require Internet access at the time you wish to use them (e.g. Location mapping, Transfer data) and these are flagged in the app. So the data I enter into HiveSmartHQ is stored on the device - how do I protect it? Setup your device so that it performs automatic backups to the cloud (this is an option for both Apple and Android devices). This will include all HiveSmartHQ data & settings - along with all your other app and device settings. Note: Using either of these options is a really wise move in case you lose your device, or it breaks. Can HiveSmartHQ be used in a large commercial operation with multiple beekeepers? Recommended: Use a single (central) device with HiveSmartHQ to capture operation-wide data using printed Forms to capture the on-site information. Service, Collections and Extraction Forms are available on our Tips page. And if you're an employed beekeeper, you can use it for just the Hives and Locations that you look after. Can I really start using HiveSmartHQ for free? 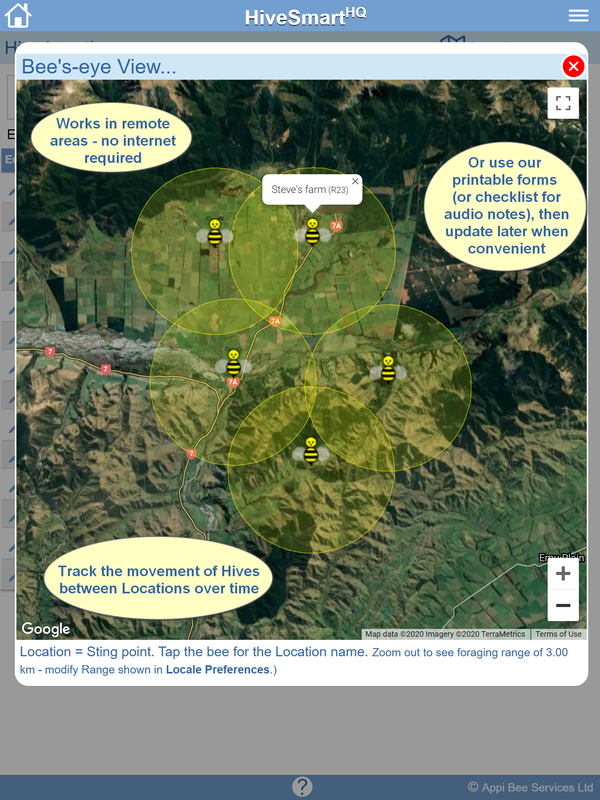 HiveSmartHQ is free to download and you can add as many Locations and Hives as you wish and more than 100 "Services" (i.e. inspections) for free. That's about a years worth of inspections for 5 Hives, or ~5 years for 1 hive (based on ~20 inspections per hive per year*). In the US, it's just $0.07 per Service after that (i.e. approx. $1.50 per hive per year - local pricing of course depends on the currency that your local app store uses, and the foreign exchange rate with the US dollar applied by the app store). The app uses Service Credits: The first inspection recorded for each Hive is free while each subsequent one uses up 1 credit. The initial installation includes 100 credits with no time limit on their use. Various-sized bundles of Service Credits (30, 60, 100) can be purchased from within the app when needed to top up the Service Credit balance. In the US a bundle of 30 Service Credits is just $1.99. The right bundle size for you will depend on how many Hives you operate and how frequently you inspect your Hives*. Even if the Service Credit balance reaches 0, all features can continue to be used apart from adding more inspections. 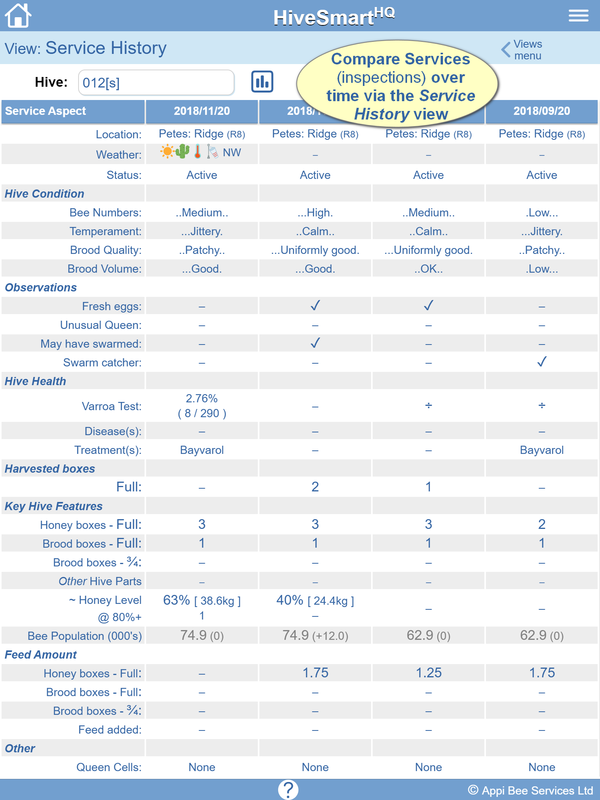 The feedback from beekeepers using the app is that HiveSmartHQ significantly improves day-to-day efficiency, provides valuable information that helps manage your hives - including the "source-of-origin" records increasingly required in today's food-production world. Service Credits are used so that we can keep the app free of advertising - i.e. by not including advertising, it means that some other revenue source is required to fund the costs of ongoing development and support. * Situations may vary depending on the number of Hives being supported, beekeeping style and extent of winter hibernation. Note: As well as the 30% fee charged by Apple & Google on all purchases via the app, we pay our share of taxes as a responsible corporate citizen. This includes applicable Sales taxes, as well as Corporate tax at 28%. Why does HiveSmartHQ avoid using subscriptions? Firstly, the App stores control the way in which products can be offered. If we offered a subscription it has to be done by time (e.g. 12 months) and/or defined groups (e.g. the number of Hives) such as 1-10 Hives, 11-20 Hives and so on. 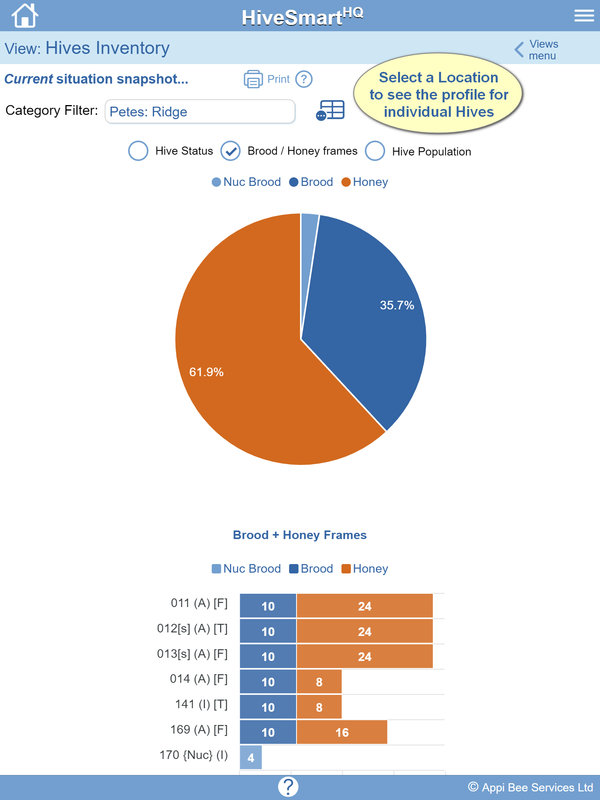 However, grouping like this means that someone with say 11 hives would be paying the same as someone with 20 hives... which just doesn't seem right to us. Futhermore, subscriptions also stay the same regardless of the season - even when things are quiet over winter and you may use the app less, so a time-based approach is also unfair. We also know that there's also significant variation in how frequently individual beekeepers like to inspect their hives. All this points toward the number of Services (inspections) providing the most equitable way to base any pricing. This approach also recognises that the more the app is used the greater the benefit derived from the information. By not using subscriptions, it means we're able to ensure you'll always have access to your data via the app, even if you decide to not use it for a while. Whereas a time-based subscription approach limits access to a defined time period, beyond which apps generally prevent access to your own data in some manner. 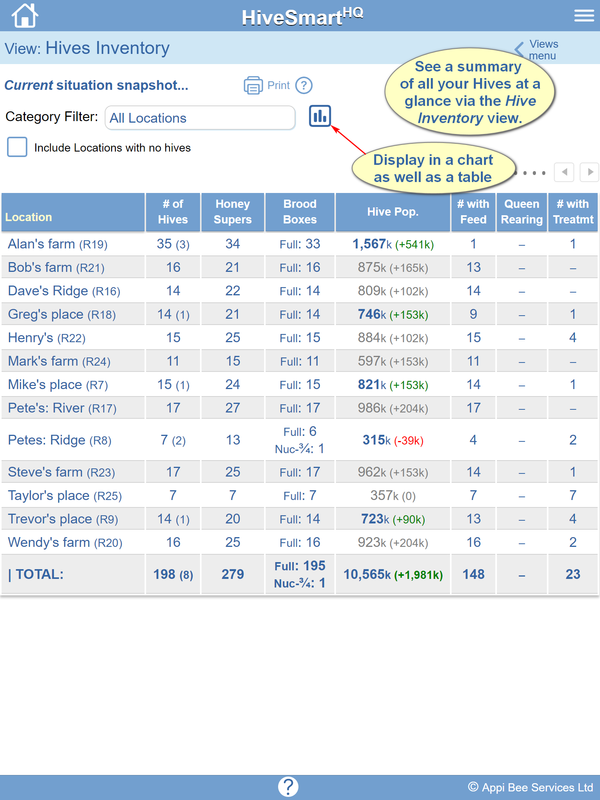 Finally, using Service Credits allows for continued access to the other features such as Collections, the Equipment Inventory, Action Items, KnowledgeBase and Seasonal Checklists (even if the Service Credit balance reaches 0). Does HiveSmartHQ require any personal information to use it? Nope. No "stings" attached here: it's obligation free - HiveSmartHQ does not require any personally identifiable information to use the app nor does it access any of your personal info on your device. Is the data entered into HiveSmartHQ shared with anyone? Is there a limit in HiveSmartHQ on the number of Apiaries (i.e. 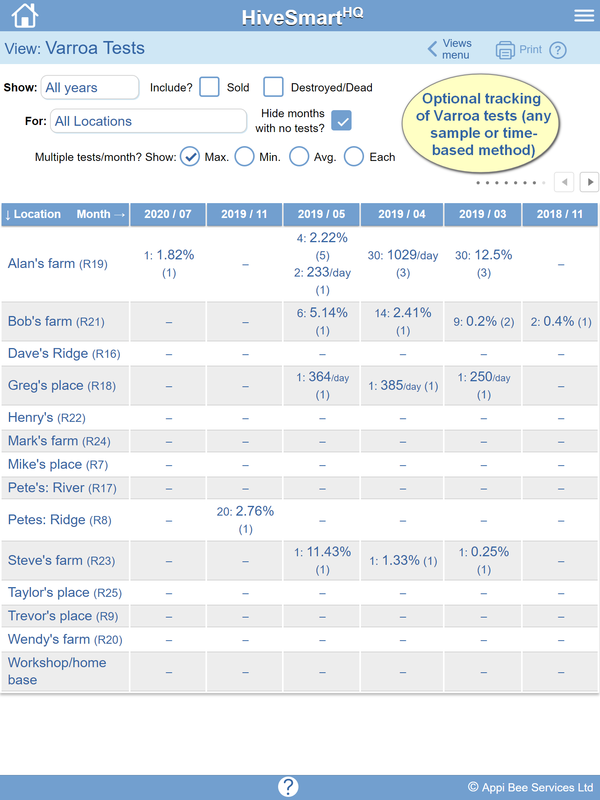 Locations), Hives or Services (Inspections)? Good question. If you've got more than 10,000 Locations (apiaries) then yes - we're so sorry! If you've got more than a million Hives, then yes - apologies again, it just can't handle 1,000,001. On the other hand, it is completely unlimited in terms of the number of Services (inspections) so you can add as many as you need. Why does HiveSmartHQ use the term "Services" rather than "Inspections"? It's not a biggie - we just appreciate that beekeepers do more than just observe when they visit their Hives. "Services" just seems to better reflect all of the activities and effort involved in taking care of your bees. How do I find which version of HiveSmartHQ is installed on my device? Since version 1.4.4, the version is displayed right on the Home window under the home icon (top left). The version number is in the App Info... section of the displayed Technical Summary. How do I keep up to date with HiveSmartHQ news? Register your email address with us via the app using News Registration (via App Options & Settings). Contact us via one of the options in the Support section below and ask for your email address to be added to our list for HiveSmartHQ News. Have a Question, Suggestion, Issue or some Feedback for us? Or choose to Register your email with us if you would like to be advised of news (issues, events or information) specific to HiveSmartHQ. © Appi Bee Services Ltd 2019. All rights reserved.